Tempora Mutantur | These are mutant times! 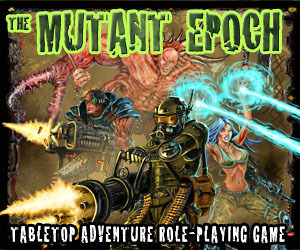 The Fall has long since wiped out civilization, leaving the planet’s surface a savage land of radioactive waste crawling with mutant creatures, and forcing the few survivors underground to live as best they could. Your community – called Tau – has endured through the long years since the Fall, its inhabitants sheltered safely beneath the earth. I’ve updated the printable player cards to include descriptive traits, which means they’ve lost the clipart. (Original design from artikid’s designs). Okay – here’s a collected one-page version of my recent SPECIAL Abilities and Descriptive Traits posts, along with an updated version of Quirks. As an alternative to SPECIAL Abilities, the referee may consider using more general “Traits” in his campaign. A Trait is a free-form descriptor of something notable about the character. PCs can have two Traits, and players are encouraged to write a short narrative (30 words or less) incorporating these Traits into their character description. Traits can be inherent capabilities (SPECIAL Abilities, for example), crafts/skills (either self-taught or trained), specialized knowledge (history, science, and/or the occult), etc. Traits should not replicate specific class abilities, and referees must take care to ensure that Traits are realistic and that this narrative system is not abused. Like SPECIAL Abilities, Traits can provide an advantage to Adventuring Feats. The player must describe how the Trait applies before rolling the dice. Stassen is simple, both in thought and action. A dedicated bodybuilder of exceptional STRENGTH, he also possesses unexpected WILLPOWER. The referee might choose to grant this character advantage to deeds of raw power and on will-related saving throws. Descriptive Traits are definitely more of a “new-school” system than most of the Tempora Mutantur ruleset. (See, for example, the Aspects approach in FATE RPG.) However, the referee is recommended to check out Blood of Pangea by Olde House Rules for a narrative implementation consistent with OSR principles. A few months ago I picked up Pits & Perils from Olde House Rules. It’s modeled after the numerous war games-turned-fantasy RPG campaigns that proliferated during the early 1970s.